Is Iceland more than Just Waterfalls and Ice Cubes? Full time dad, police officer and keen landscape photographer. 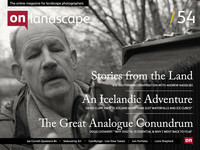 Our new feature this issue is 4x4, a set of four mini portfolios each consisting of four images related in some way. If you would like to submit your own 4x4 portfolio please visit this page for submission information.